I was reading Steve Blank’s blog on machine learning start-ups yesterday, where he described how technical infrastructure innovations follow a Hype Cycle with characteristics defined by the Gartner Group. The Hype Cycle follows the life cycle of emerging technologies and will be applicable to the new generation of robotic vision technologies currently being developed by the Australian Centre for Robotic Vision. Robotic vision, as the name suggests, encompasses both robotics and computer vision, each has been moving through new hype cycles, despite such technologies first appearing more than 50 years ago. Phase 1 – Technology Trigger: A potential technology breakthrough kicks things off. Early proof-of-concept stories and media interest trigger significant publicity. Often no usable products exist and commercial viability is unproven. Phase 2 – Peak of Inflated Expectations: Early publicity produces a number of success stories — often accompanied by scores of failures. Some companies take action; many do not. Phase 3 – Trough of Disillusionment: Interest wanes as experiments and implementations fail to deliver. Producers of the technology shake out or fail. Investments continue only if the surviving providers improve their products to the satisfaction of early adopters. Phase 4 – Slope of Enlightenment: More instances of how the technology can benefit the enterprise start to crystallise and become more widely understood. Second- and third-generation products appear from technology providers. More enterprises fund pilots; conservative companies remain cautious. Phase 5 – Plateau of Productivity: Mainstream adoption starts to take off. Criteria for assessing provider viability are more clearly defined. The technology’s broad market applicability and relevance are clearly paying off. The story is similar for computer vision start-ups. Index lists just some of the recently acquired CV companies. Some are acquired with little fanfare, such as the speculated acquisition of ZurichEye by Facebook. Computer vision sometimes applies artificial intelligence (AI) and machine learning, the subject of Steve Blank’s blog, and all technologies seem to be hitting the peak of inflated expectations. Phase 2 is a great place to be if you’re a start-up but not necessarily a great place to be for the acquirer, who gains technology, teams and tools but not necessarily much additional revenue and profit. Robotic vision is the gateway to a whole new set of technologies, developed by bringing robotics and computer vision together. While robotics is about machines that perceive and interact with the physical work, computer vision involves methods for acquiring, processing, analysing and understanding images using a computer. Combining the two produces the key technologies that will allow robotics to transform the way we live and work by giving robots visual perception. So, where is robotic vision on the hype cycle? Robotic Vision is in Phase 1, just kicking off, with research groups like the Australian Centre for Robotic Vision developing a few proof-of-concepts like the crown-of-thorns starfish robot, COTSbot and the agricultural robots AgBotII and Harvey. It will soon be heading into Phase 2, which is a great time for new start-ups looking for a big early exit — but will the window of opportunity for robotic vision companies be narrow? Given the high level of current interest in fields related to robotic vision, start-ups developed around these new technologies will need to enter the market soon. Companies based on the interlinked fields of robotics, machine learning, AI and computer vision have been acquired by corporate giants such as Google, IBM, Yahoo, Intel, Apple and Salesforce, at increasing rates since 2011 (see CB Insights). 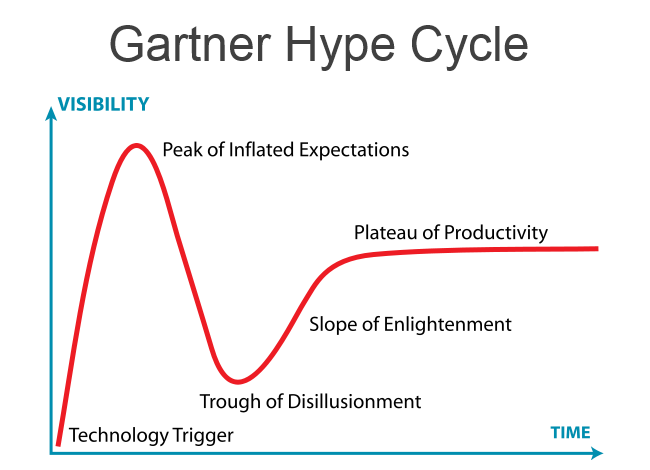 How long can the hype continue before we enter into Phase 3, the trough of disillusionment? The risk for robotic vision is that by the time start-ups have formed around newly created technologies, the hype cycle for related technologies will change. If robotic vision doesn’t get a foot in the door, RV technologies will skip the peak of inflated expectations altogether. On the plus side, robotic vision technologies will also enjoy an accelerated path towards the slope of enlightenment on the heels of related technologies. Good news for the application of robotic vision to solve real world challenges but bad news for robotic vision start-ups – unless they form soon.